Tag Archives for " holiday pounds "
​​The holidays are a time where many of us get caught up in a whirlwind of overwhelm and stress. Our to-do lists double and even triple, with the addition of holiday parties, decorating, shopping and cooking. It's easy to get sucked into the eye of the storm and not see a way out until January 2nd hits. By this time, it's almost too late and burnout has set in. But this doesn't have to be the case for you this holiday season. You do have a choice. You ​CAN ​thrive through the holiday season in a peaceful and balanced way, so when the New Year comes you​ feel ready to move forward in an empowered way, instead of feeling like you have to start at square one and fix all the damage you did. ​​​It's no secret that this time of year can be filled with obligations and family traditions that often feel overwhelming. During my annual 7-Day Balanced and Blissed Holiday Challenge, I challenge ​hundreds of participants with the action of choosing things that feel aligned with them, versus participating out of obligation​. This very action includes being able to say No, which can be hard for a lot of people. 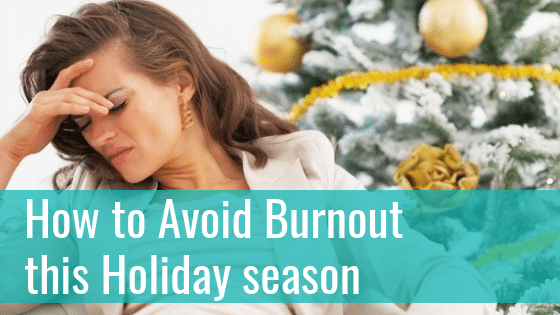 In order to not burn yourself out this holiday season and avoid the overwhelm that often comes along with it, I encourage you to choose your experiences and to-do's wisely. Take out a piece of paper and draw a line down the middle. Write the heading, "To-DO" on one side, and the heading "Events" on the other. Write out everything you feel like you have to do under the "To-Do" Heading (ie: getting a tree, baking cookies, decorating, buying gifts for everyone at the office, ​even long time traditions), and then write out all the events you need to attend including kids (if you have them) plays, holiday parties and bake sales under ​the "Events" heading. Once you ​complete your list, go down each column and circle anything that IS a priority or feels GOOD for you to do. Then go through the list again and X out anything that feels heavy or like an obligation. Note: This process won't be easy, especially if you are a people pleaser or someone who is afraid of being judged for not participating. You will also have to learn to let go a bit and really tune in to the things you WANT to do (see below). How is this bringing balance to my life? How is this bringing bliss and joy to my life? Will this bring balance to my life if I do it, or will I feel resentful? If the item feels obligatory, overwhelming etc, cross it off your list and LET GO! You will be OK, I promise. Often we will do things out of obligation or fear of what others will think of us if we don't bake cookies for that bake sale, or show up to that party. ​​This practice will be one of the most powerful ​actions you take ​for yourself this holiday season. Life coach and personal growth guru, Tony Robbins says, "If you don't have 10 minutes to give yourself, you don't have a life...." This is so true and one of the main reasons why people feel stressed out and overwhelmed. By starting your day with what I call the 10+10, you will set yourself up to feel grounded, balanced and connected this holiday season instead of harried, frazzled and buried under your to-do list. The 10 + 10 consists of 10 minutes of movement and 10 minutes of "me" time first thing in the morning. ​Of course, both of these ​activities can be longer, especially if you like to do your workouts in the morning, but start with a minimum of 10 minutes for each. ​Most importantly though, is the 10 minutes of "me" time where you either meditate (I love using the Insight Timer App), breathe, read something uplifting​ excerpts from a book (here is my favorite,) connect to your own heart, journal ​by ​dumping whatever is on your mind on the page, or set intentions for the day. This action is life-changing and will set you up to have a more empowering and connected day so that you don't' feel as overwhelmed by all you have to do. Also, studies show that ​ people who have consistent morning routines are more successful than people who don't. Instead of hitting the snooze button 3 or 4 times, get up out of bed and give yourself the time you deserve. ​​Many of us are living in the future or the past. This causes anxiety and overwhelm. ​You are ONLY one person, who can only do so much. The more you keep thinking about ALL the things you have to do, versus staying present and doing the next "right" action, the more ​stressed out you will feel. ​Practicing presence is one of the most impactful and balancing things you can do for yoursel​f this holiday season. I know ​it doesn't come easy for most, myself included, but you can access it with a little bit of awareness and pause. Every time you catch yourself feeling anxious or overwhelmed, STOP and take a deep breath. Seriously. It's incredible how quickly it works. Know that these feelings come from you not being present. Then take another. Once you take 2-3 deep breaths, ​then ask yourself if you are living in the future and worrying, or are ​you focusing on the task at hand and what's in front of you? By taking this pause, you will get reconnected to the present moment and then you can make a discerned choice ​ about what needs to be done next. Again, you are ONLY one person, and can only do so much. DELEGATE if you need to. Ask for help and don't think you need to be Superwoman or Superman. By following these 3 empowering actions this holiday season, I guarantee you will feel so much more balanced and peaceful by the time the New Year arrives. 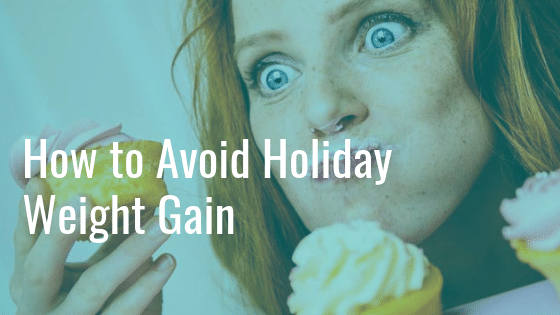 And if you are concerned about weight gain this holiday season, ​check out my recent blog about How You Can Avoid Holiday Weight Gain. ​The holidays ​are in full swing. Stores are bustling, parties are happening and people are stressing. It's no surprise that most people will gain anywhere from 5-15 pounds throughout the holiday season. ​This is usually the first thing to get pushed down to the bottom of our to-do list at this time of year. But, it's ​more important than ever for you to move your body in some way over the holiday season, for more reasons than ​avoiding weight gain. Exercise helps to relieve stress, stabilizes your blood sugar, keeps your metabolism fired up and also supports healthy sleep habits.​ This is not the time to avoid your body movement, even if it's for only 20 minutes a day, just do something. And preferably something you enjoy! If you struggle with this commitment, invite others to join you, so it doesn't feel so grueling, and you will have a real reason to show up. ​Just because there are ​tons of treats around all the time, especially some that we only see once a year, doesn't mean you need to stockpile them and overdo it. This doesn't serve you on any level; mentally, emotionally or physically. ​Plan to enjoy and truly savor the treats you do love. Take a few bites, really taste them. Put them on a plate, walk away from the table and go sit down to eat. Don't put any negative thoughts toward yourself or the food, because that will only make you want to indulge more, and leave you feeling full of regret. I love to stick to the 80/20 or 90/10 guideline, of enjoying those sweet treats about 10-20% of the time throughout the season. This way I don't feel ​deprived or restricted, and I can REALLY enjoy what I am eating without all the thoughts of guilt and regret. ​​If you keep your ​attention on what the holidays are really about, which is being with family, connecting and spreading cheer, then food won't be the central focus. It can be easy to get caught up in the holiday craziness, but remember, you ​DO have a choice about what you put in your mouth and where you put your attention. Overextending yourself during this time of year will deplete you, and create feelings of resentment. Resentful people usually turn to food to help them feel better. Also, if we are burned out and depleted, it's harder to make sound decisions that are in alignment with our healthy lifestyle. ​Take a moment and write out all your To Do's, parties and commitments this season. Then go down the list and ​cross out the ones that feel obligatory or stressful, even certain traditions you think you need to keep out of fear of upsetting others. ​Last year a client of mine told her kids they weren't going to bake cookies anymore because it was so stressful for her, and she didn't enjoy it anymore. The kids were actually relieved and they created a new tradition of making homemade cards instead. ​If you are worrying what others will think of you when you start saying no, or not doing what you always do this time of year, then tell yourself that the decision to tak​e care of, and honor yourself is the best thing you can do for those around you. ​Most of human suffering comes from the stories we make up in our heads about things. If you are constantly making up a story that you don't have time, or that you will never be able to eat healthy over the holidays, then those things will be true. I'm sure you've seen that quote by Henry Ford, "Whether you think you can, or you think you can't, You're Right." ​Everytime you find yourself spinning in your head about food, your weight, your to-do list, etc, redirect your thoughts to the present moment and what your VERY NEXT STEP will be. All you can do is put one foot in front of the other. Future thinking will only create feelings of anxiety and overwhelm. Tell that inner voice, NO THANK YOU, and then name one thing you can be grateful for RIGHT NOW and move forward from there. Implement these Five Tips this holiday season and I guarantee you will not put on weight or feel burned out in the New Year. 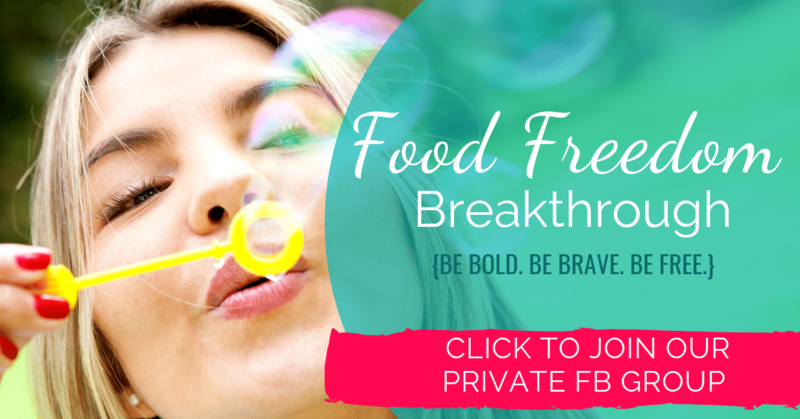 ​If you need ​further support, join me inside my Private Online Food Freedom Group by clicking the graphic below. ​The holidays are quickly approaching and it's the time of year where many ​people ​tend to overeat, over indulge and feel a bit out of control with food. This often leads​ to unwanted weight gain in the new year and feelings of frustration and hopelessness. 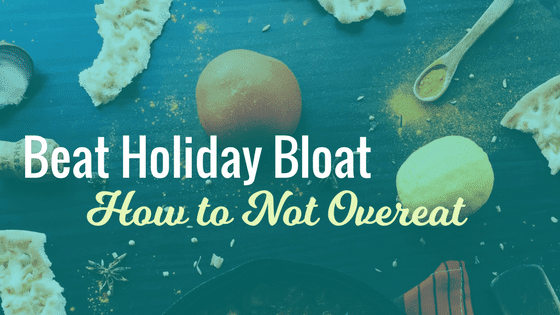 ​It's easy to overeat at the holidays because ​not only is there a lot of ​high-fat, gooey, sugary foods laying around, but emotions ​tend to run high at this time of year as well, which leads to ​eating emotionally. Emotional eating, even eating from a feeling of nostalgia, as most of us do at holiday season, results in the ingestion of hundreds and even thousands of extra calories. The average American will gain anywhere from 5-10 pounds during the holiday season due to the amount of food that is available, partnered with mindless and/or emotional eating. Don't starve yourself the morning of the holiday, or even the days leading up to it anticipating all the goodies you will eat. This will only set you up to have blood sugar crashes and massive cravings. On the morning of Thanksgiving make some time ​to move your body​ not just to burn calories so you can eat more, but to get your blood pumping​ and to give your body some care and attention. ​Afterward, eat a hearty, healthy breakfast with a combination of protein, complex carbs and healthy fats. This will help to set your blood sugar up for​ stability during the day and there will be less of a chance that you will overeat. Overeating disrupts digestion ​and prevents ​proper absorb​tion of nutrients. It can also lead to heartburn, indigestion and bloat. Bottom line, it's not comfortable or good for your system. It's common to start to put rules around what you will and won't eat during this time. Or see the food as good and bad. Or you may even make negotiations or deals with yourself before you get to the Thanksgiving table. The more time and energy you spend ​thinking about these things, the more you will miss out on the experience of the holiday and enjoying the pleasure of the food. ​Come to the holiday with the intention being a normal eater; someone who listens to their hunger and satiety signals, eats what they want, enjoys it and moves on without judgments. By putting rules and attention on how much you will eat, or trying not to think about it will only keep you stuck in the vicious cycle and leave you feeling at odds or deprived. This can lead to overeating and the feeling of white-knuckling through the day. ​Put away your phones, computers and anything that will distract you from being present with your loved ones. The holiday is about enjoying time with ​the people you love the most. Get out a board game, go for a walk or play some cards. As I mentioned in Tip 2, by putting so much focus and attention on the food, we can often set ourselves up to "fail." When ​you are trying to control your food, or white-knuckle through a holiday, it will set ​you up to feel like ​you are going off the rails and feeling deprived. The truth is, our bodies don't actually NEED a lot of​ food an doften our eyes are bigger than our stomachs, or we don't wnat to miss out, so we overdo it. Just remember, that you do have the choice and you will probably feel a whole lot better if you choose instead of control. This is something I teach ​all my premium, one-on-one clients who are emotional eaters, over-eaters and binge eaters. It's a highly effective strategy, because it ​attunes us to what our body really needs. Practicing the pause means taking the time to slow​ down and attun​e to your body before you eat. Stop, take a deep breath and check in before you move forward. Your body will always tell you what it wants, and it will also tell you whether it's hungry, satisfied or full. Slowing down will help you tune into those sensations even more. ​It's very common for people to shovel down the food on their plate in 3 minutes flat so they can have more, but this isn't always in service to you or your body. You can enjoy the foods you like, but there is no need to stuff yourself to the gills with them. Your body will only suffer the consequences from the stress of that. Instead do your best to eat more mindfully. Savor the food, put your fork down between bites and engage in lively conversation with others at the table. You can always get more, but you might not need to. Slowing down will actually help you understand if your body is full or not. And it usually supports you in eating a whole lot less than you normally would. ​Savor the experience, don't rush through it. ​Most people are not able to know when they hit this point. When you tune into your body's subtle cues (Tip ​5), you will be able to tell when you are satisfied. This will prevent you from stuffing yourself like the turkey on your table. ​I can usually tell I am getting full when I take my first deep breath while eating. ​Then I stop, ​ put my fork down and take a break. I give myself ​a little time before continuing on, so that my food can digest. ​Your food expands around 20% after ​eating, so if you are stuffing yourself to the gills, you will be even more ​packed 20 minutes later. You can always go back and eat more if you need to, but it's better to stop before you are feeling full. Go for the feeling of satisfaction. ​I know this will be hard, but I guarantee you'll feel a whole heck of a lot better! This tip is hands down my favorite one because it puts us into service before we move into our indulgent day. Spend your Thanksgiving morning helping those in need. This will put life in perspective when you see how many people in your own neighborhood don't have family to spend their holiday with, or don't have food to eat. Being of service is the best way to get your mind off food and engaged in something meaningful. ​I know that navigating the holiday season can be tricky, but using these tips will support you in sticking to your health goals, as well as being in alignment with what is important to you. Take the focus off food, and put it on those around you or those in need. Your body and your health will thank you!